On Second Scoop: Ice Cream Reviews: Spring is in the air! new products - part 2!! Spring is in the air! new products - part 2!! Man am I glad I went to a different Shaws last night. 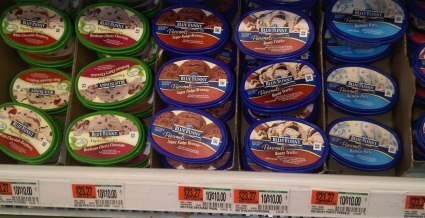 I was just going to grab some chicken and some Ben & Jerry's, but instead I found myself happily going back and forth through the freezer aisle a few times as I discovered another treasure trove of new stuff to psych me up for 2011. First big news? Blue Bunny has invaded Shaws! Very cool! Even more interesting is that they've shrunk down their mini servings from 7 fluid ounces to 5.5. Thing is, I think the slightly larger ones were coming in at $1.29 while these are hitting the magical one dollar mark. I was pretty excited to see that they've also added their all natural frozen yogurt to their mini servings. I've been waiting forever to try something besides strawberry banana. I'll have one of these up on the blog soon enough. What's this?? 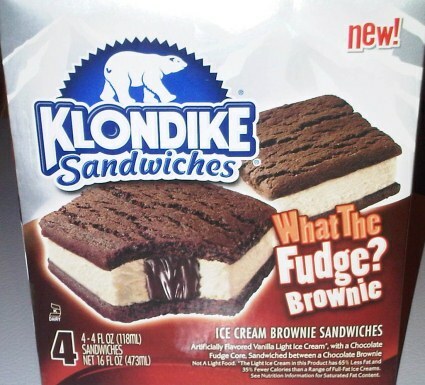 New Mint Chocolate Chip Klondike bars! Very cool and I'm glad to see that Rocky Road isn't the only new flavor. I was totally shocked to see this, but at the same time, it makes perfect sense. I almost fainted when I saw this bright orange box! Peanut Butter ice cream with REESES peanut butter swirl dipped in a milk chocolate flavored coating. Oh they look so tasty! I want the whole box for myself! Well look what Unilver has imported in for us: Magnum! fresh from the UK. Now check out Magnum's very tasty looking U.S. website. Now that's how you make people hungry! 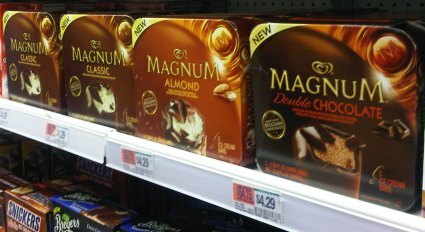 What we see here is Classic, Almond, and the one I will probably try first: Double CHOCOLATE. The website says there is a also a white chocolate and a dark chocolate version. Oh yeah! Yeah, I had to pick this up so we can compare it to the Mrs. Fields version real soon. Whoa. 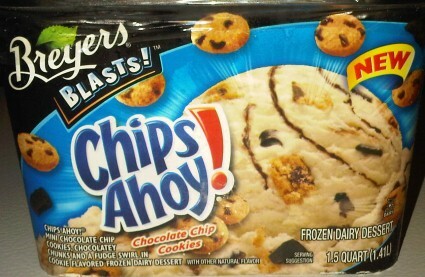 The Reese's ice cream cups and Mint Chocolate Chip Klondike bars are calling my name. I hope they have that gritty PB in the middle and it doesn't taste generic. 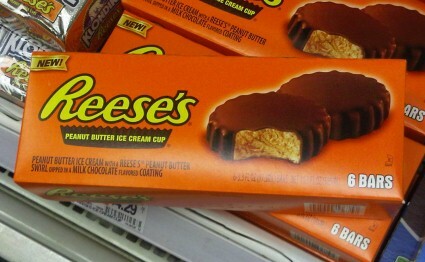 we all need to be ashamed of ourselves for not having thought of the reese's ice cream cups before now. admit it people, we've all failed. I had a mint Klondike bar today and I can tell you those things are ABSOLUTELY DIVINE!!!! Now I just hope I don't mow through the whole package in one sitting!